Trains are cool. 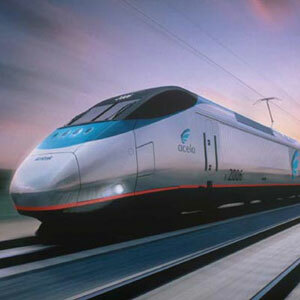 And fast trains are fastly cool. I live nearly 15 miles from my office. And I would love to be able to take a train, preferably a fast one, to the office each day. However, there are some constraints on even an imaginary train. I have to take my kids to school. So, even if I can take the train to work, I have to drive to school. My kids would appreciate it if I picked them up. Sometimes, more when they were younger, I have to go to school to get them because they are hurt or sick. Now that they are older, they need to go to places like dance, karate, soccer and basketball after school. I have to go to places like lunch, the grocery store and Wal-mart during the day. All of this is a not so obvious way of saying that unless the train stopped at my door, my kid’s school, the grocery and each of our events, I can’t use it. None of the things in my life are close enough that I can afford to give up the car. My wife was born in Brooklyn. And I love to visit. Everything is so close to the house that you can go for days, weeks I suspect, without having to go further than 6 blocks. Within just 2 are more than 20 places to eat, a movie theater, grocery and drug stores. Everything. But here, in Raleigh, and most place sin America, things that people need and want are spread all over the place. And because of that, trains, being static once built, are of very limited use to a very limited population of people. “The commuter rail plan and the light rail plan just don’t make sense to me,” said John Pucher, a professor in the Bloustein School of Planning and Public Policy at Rutgers University in New Jersey. He is a visiting professor this semester at the University of North Carolina-Chapel Hill in the Department of City and Regional Planning. Pucher has more than 40 years of experience in transportation planning. He supports alternative modes of transportation, but he said planners often underestimate cost and overestimate ridership projections. “It’s just so difficult in this very decentralized, very sprawled metropolitan area,” he said. I wish I could take a train to work. Maybe in 12 years after the kids are in college and I have fewer variable trips, I can. In fact, when I was single and living in Seattle, I often had thoughts of moving to Bainbridge Island and commuting by ferry. I could arrange to work from home in the morning, miss the massive morning commute, take the boat across and be in the office by 10. Same thing on the way home. But right now, the way that we have built our cities, the juice ain’t worth the squeeze on this light rail. The money just doesn’t make sense. A better option for Wake County would be a “bus rapid transit system,” he said. The system essentially allows buses to use high-occupancy vehicle lanes on area highways, which he said is more efficient, flexible and cost-effective than rail systems. Update to an earlier post. DATA was supposed to open its $17.6 million Durham Station Transportation Center in February. But now, the new center, located at the old Heart of Durham Hotel site on Chapel Hill Street, will not be open until the middle of March, according Ieshia Robertson, a city spokeswoman. Robertson said the actual facility will be completed on time, but N.C. Department of Transportation is requiring the city to do some work on the surrounding streets. Look, I know that we want mass transit to succeed. But it won’t. Not here, not now.